Wow, it’s already December! I have a couple of milestones to note as the year winds down….last week’s post was my 100th and my blog will celebrate its second birthday in a few days. So, I looked back to this time last year and then again to this time two years ago and noted something in common…I was having the urge to weave something wide. Well, wide for me anyway…maybe not that wide in the world of backstrap weaving. Funny that I have arrived back from this latest trip with this same urge and a color idea not all that different from the Montagnard inspired piece that I wove last year. Around this time last year I was arriving home after having learned the weft twining technique practiced by the Jarai and Rhade people of the Vietnamese highlands. I warped for a wide-ish piece to practice their simple warp float technique as well as the weft twining that they use to finish the ends of their textiles. 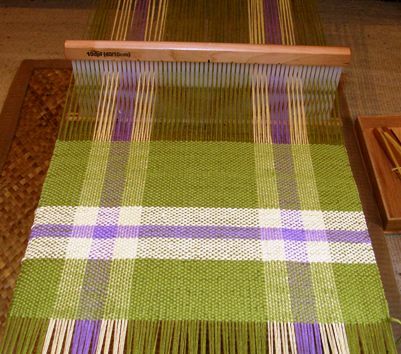 This time two years ago I was very excited about having received 12″ rigid heddles in a swap and was busy weaving simple balanced plain weave runners and placemats. I was so happy about how easy and fun it was. Now I have the idea of pushing my weaving width just that little bit further and have warped up for something which is just about half as wide again as that Montagnard piece. Maybe it’s because I have been on the road weaving lots of narrow bands with friends in the US that I have this urge to get my hands into something wide. So I have had to dig through my bins of tools and pull out the big sticks and I have to say that I am very grateful to Lorraine in California who sent me a loom that she had bought in Guatemala when she traveled there in the 70’s. I could easily make long loom bars with a trip to the hardware store. In fact, the painters have just left a very long wooden pole upstairs on the terrace. I am patiently waiting to see if they come back to claim it before snapping it up. In the meantime I have Lorraine’s long Guatemalan bars. 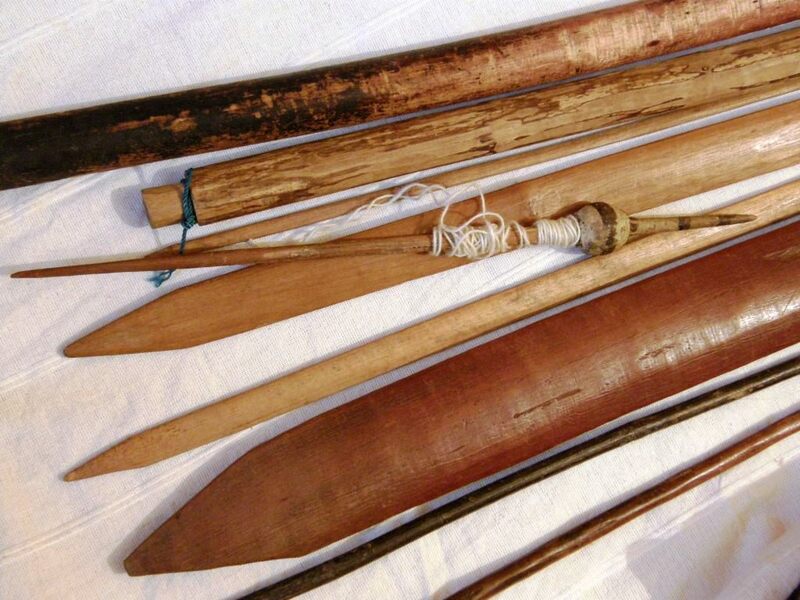 What I value most of all from the things she sent me are the swords…five beautiful long ones in varying widths as well as the shed rod…a good, thick, yet surprisingly lightweight piece of wood. See how that large, polished heavy one looks next to my favorite little band sword from Peru! Without these swords I would not be able to weave as wide I would like. 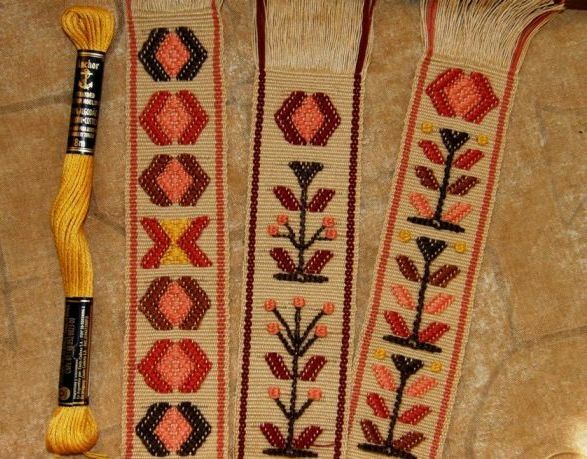 I do have some battens left over from my Navajo weaving days but they would not do the trick as beaters anywhere near as well as these Guatemalan beauties. I would have to have some specially made. Above you can see the tools on top of the wide warp…an old favorite color scheme. I have decided that I would like to make a series of weavings in these three colors. I have no plan for the finished pieces. They could be sewn onto the storage bags that I have been wanting to make, used as one face of a pillow cover or simply hung on the wall (if I can find space!). For now I am just enjoying the process of winding and preparing all those warps ends and am discovering that opening the two sets of heddles for the pebble weave is quite a work out! 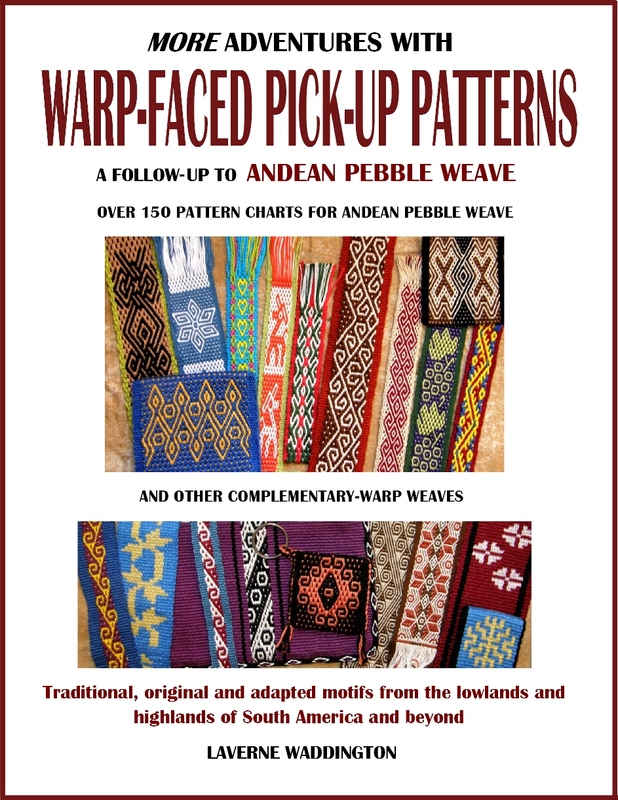 I am weaving a pebble weave pattern using the two-heddle technique that I learned in Peru which I teach in my book Andean Pebble Weave. The design is from a band I saw on the website of tablet weaver Kurt Laitenberger. 1.know your yarn, know your width and know your technique. What I am saying is, don’t go wide with a yarn you have never used or sampled many times. I know that some people don’t bother with this but I also like to know the width I am aiming for rather than just warp up and see what turns out. So, there is a lot of measuring and calculating that goes on before I start warping. I warped for 14 1/2″ for the pebble weave piece above and calculated how many warp revolutions I would need for the 6 1/2″ pattern area and then drew my chart. Then I calculated how many ends I would need for the solid color parts to make the 14 1/2″ desired width. 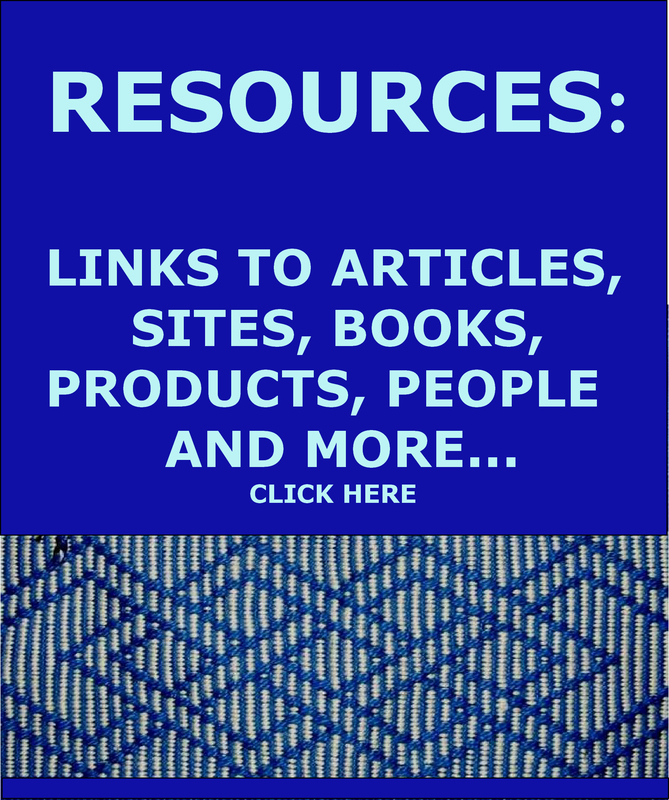 I based my calculations on other finished pebble weave projects and my notes. And, finally, I wouldn’t attempt a wide piece using a pick-up technique that I had just learned or was trying to learn. Leave that for the narrow bands. 2. Warp undisturbed and don’t disturb your warp. 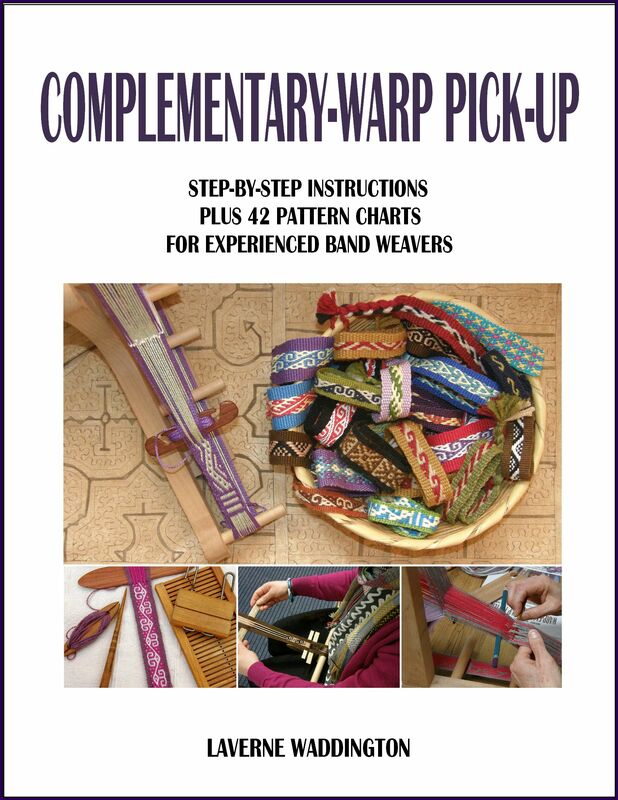 Have everything you need for warping close at hand including the loom bars and cross sticks….scissors, rubber bands or tape, lashing string, string for tying off groups of warps for counting etc.. I also had my piece of piano wire on hand as I wanted to create a third selvedge (see the picture at left which shows wire inserted in the warp ends to make a third selvedge) Fortunately I still have one piece of wire that I haven’t cut down to smaller lengths. Try to warp in one uninterrupted session…turn off the kettle, put the cat out, ignore the phone, forget that cup of coffee! Now, how to keep all those warp ends in some kind of order? I warped in three sections. The first solid color section has 184 revolutions (368 ends) of #10 cotton and I warped that as one section, put short cross sticks in and took it off the warping board placing it immediately on the loom bar and piece of wire on the floor next to me. I like to use cross sticks in the warp rather than cord as the sticks help keep the warps spread. 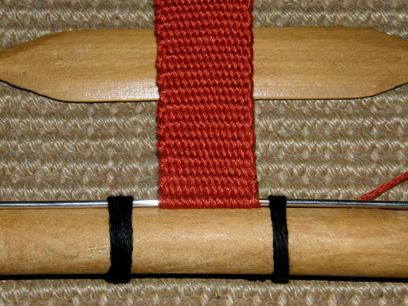 Another way to help keep the warps spread is to wrap yarn around groups of warps as shown in the picture above left. This also helps to keep count. I don’t do this myself as it means stopping frequently in the middle of winding and I like to keep the rhythm going. Now, once you have wound that beautifully-tensioned warp, do your very best not to disturb it! When I slide the warp off the warping board I try to keep my hand under the ends so that they are all lying flat and not bunching up. This saves a lot of tugging and rearranging later when the warp is on the loom. Too much tugging will mess up your tension. 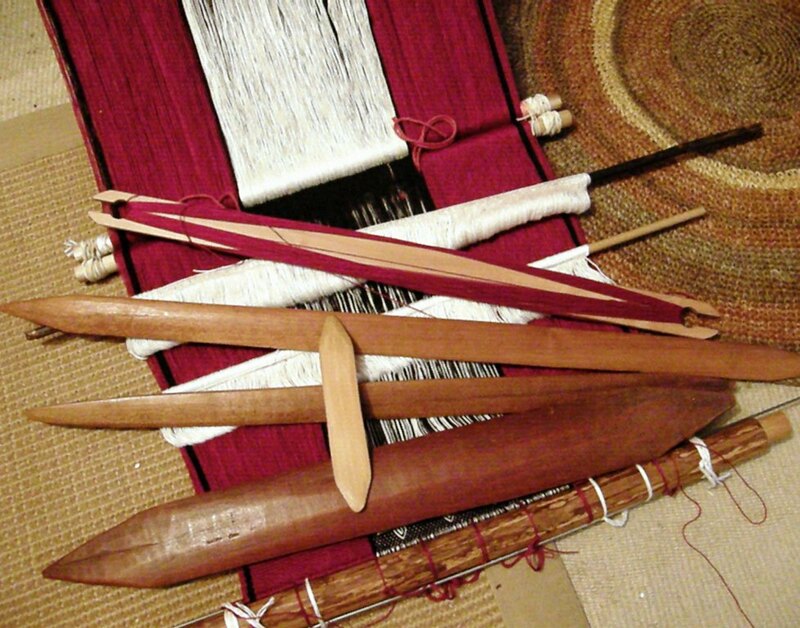 In the picture above right I show how I would hold a small group of warps when taking it off the warping board. Remember to put safety strings in your warp ends if you are separating colors using the four-stake warping method. Once the three sections of warp were on the loom bar and piano wire, I replaced the short cross sticks with two long ones and then lashed the piano wire to the second loom bar. I lashed it in four or five places. Once I had the loom set up with the warps under tension, I untied and replaced the lashing strings. 3. Slow and steady…take the time to set up and start well. 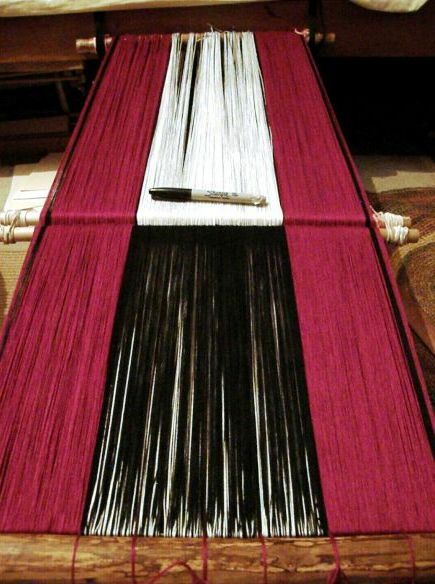 Check your knots, untwist the warps one by one and settle them on the loom bar or rod, measure. With the right amount of prep, once I have thrown the first few wefts and measured once again, I know that all will be smooth sailing from there on…just pure fun! Once I was in my backstrap and facing my warp, I measured out regular lashing points…one for the exact half way point (counting the warps to find the center), one to separate the solid color from the pebble section, another to mark the center of the solid color section etc…while measuring, measuring and measuring again. This helps ensure that the warps are not too bunched together in one section or too spread in another. You know what comes next….Please don’t hate me when I say that I like making continuous string heddles! And there are two sets to be made for the pebble weave method that I learned (well worth it I say for the picking up it saves you). But, wait! 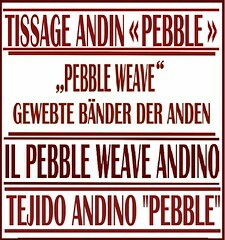 Did I tell you that my Guarani weaving teacher uses three sets of heddles when she does pebble weave? I used two of the long swords to separate the pebble sheds and then sat down for a loooong heddle making session! Not a single mistake…that is VERY unusual. May I remind you with the following photos that this piece I am weaving is NOT wide in the world of backstrap weaving. 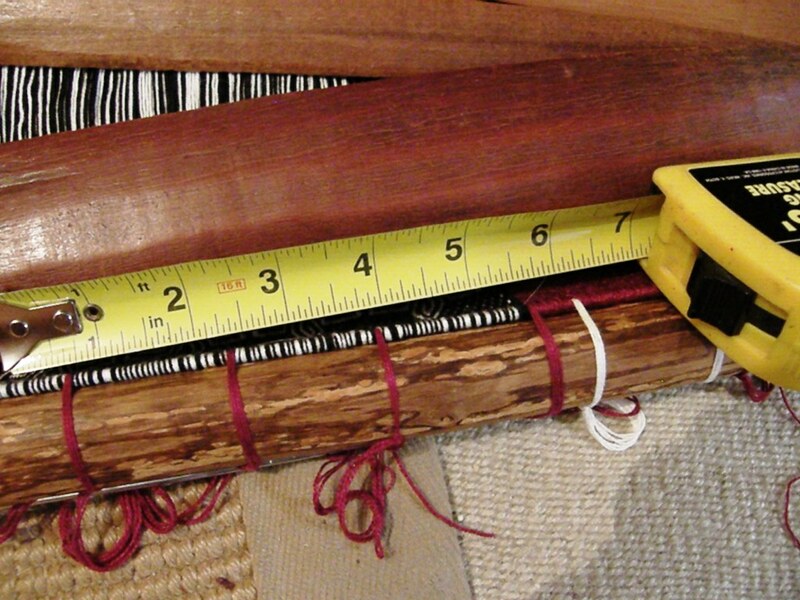 Of course, pieces of all lengths and widths are woven on these simple looms. Above left, a lady in Santa Catarina Palopo in Guatemala is inserting the long sword into the heddle shed of her tremendously wide warp. In contrast, above right, you can see the tiny sample band my Guarani weaving teacher, Angela, wisely made when she learned a three-color pick-up technique from a visiting Aymara backstrap weaver from Chile. Although Angela weaves on a vertical loom, she wove this piece on a body tensioned set-up with the warp end attached to her waist with cord. 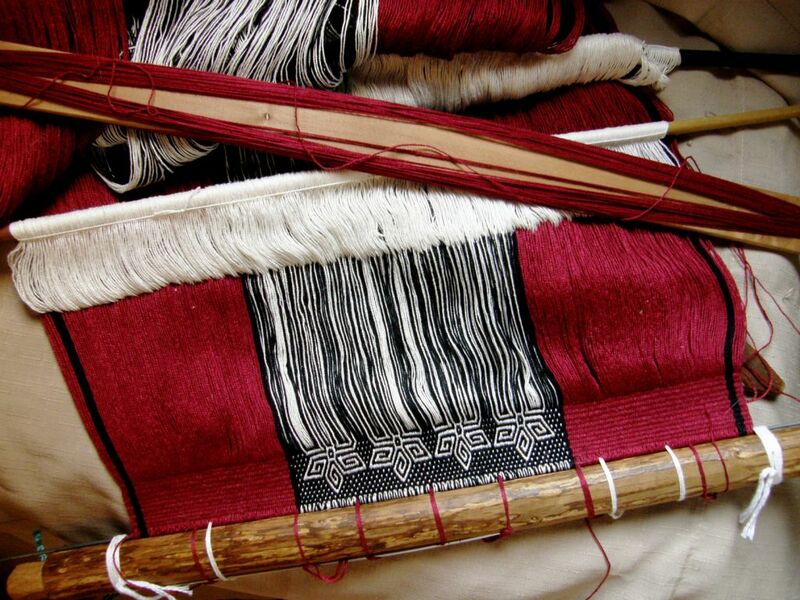 In San Roque, Ecuador, the widest pieces are woven by the men in the household. Celinda from the northern Chilean highlands is weaving a narrow band while a weaver from Pitumarca in Peru has a stunningly wide discontinuous-warp piece on her loom. Narrow, wide and somewhere in between…I can only keep trying to push my width comfort zone little by little. I hope that the series of wide pieces I am planning will help me reach another level. So, if you are contemplating going a little wider than your own comfort zone, don’t forget that there are lots of cool things that can be done with plain weave. You don’t need to do any complicated pick up patterning. I showed many examples of colorful stripes, resist dyed pieces and programmed warp patterning when our Ravelry group participated in a plain weave weave-along. Do you remember Jennifer’s beautiful pieces? Never mind if you want to make something wide but still feel nervous about all those warps… you can always join two or more bands together and create something amazing. Do you remember Amber’s tote bag? 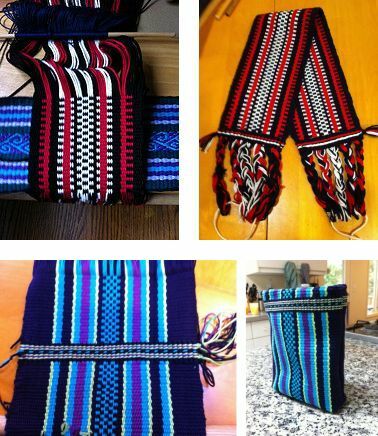 I have done a little behind-the-scenes house cleaning and have put the two tutorials on the Guatemalan patterning techniques, used to create the weft patterns at left, on their own separate page so that they now show up in the tutorial list on the side bar. As these tutorials were originally part of blog posts, there is a bit more chat in them rather than straight out instructions which I hope is not too distracting. You can see the tutorial page here. And here is a little teaser for next week for those of you who may have tried the warp substitution technique in this tutorial. Tracy, who lives in Doha, Qatar showed all of us in the Ravelry group a picture of a Bedouin textile a friend of hers had bought in a weaving cooperative in Oman. We all ooohed over the beautful black-and-white shajarah patterns and the familiar al’ouerjan design. Those of you who have tried these techniques will know that warp substitution is really quite simple. Unfortunately the back of the pieces have really long floats which can be very ugly and impractical. One way to get around that is to weave the designs in double weave. However, the weavers of the Omani textile had gone another route and have found a way to at least tie down the floats so that the back of the fabric is a lot tidier. 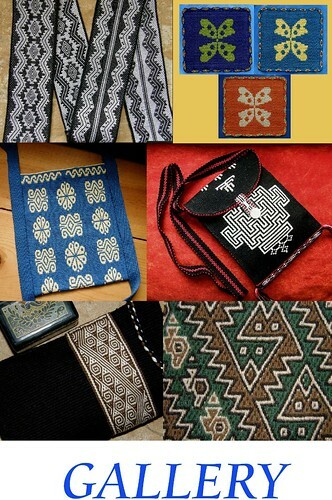 This means that you could use the woven pieces for purses or bags without having to worry about lining them or having things get entangled in the floats. Tracy suspects that the cooperative has designers who are encouraging the weavers to employ this technique to make the textiles more attractive to buyers. 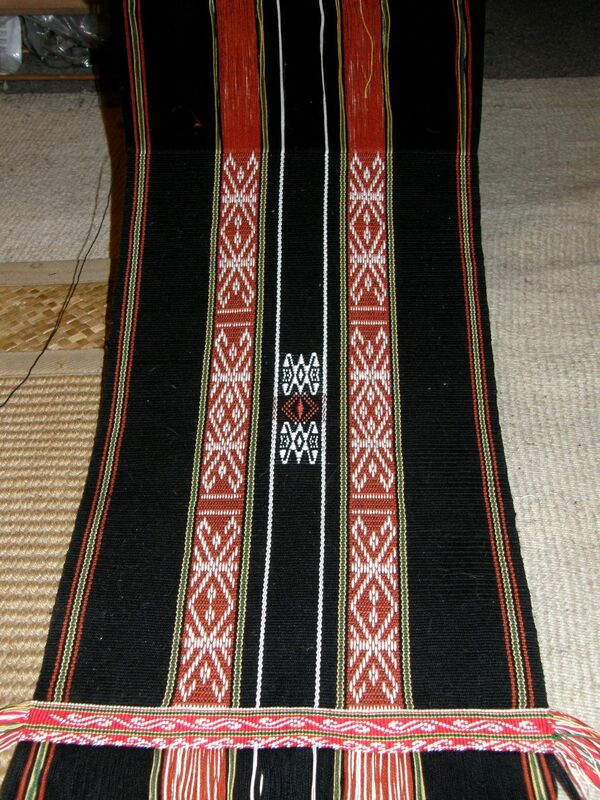 Tracy photographed the front and back of the al’ouerjan pattern strip on the large Omani textile. It was first thing in the morning when I saw it and had to sit down and warp up a sample straight away so I could figure out how they had tied down the floats. That’s my sample pictured above…right side on the left and reverse on the right. You can see that it makes quite a difference! The sample starts out with the typical long floats until I figured out what I needed to do to tie them down. So simple really! 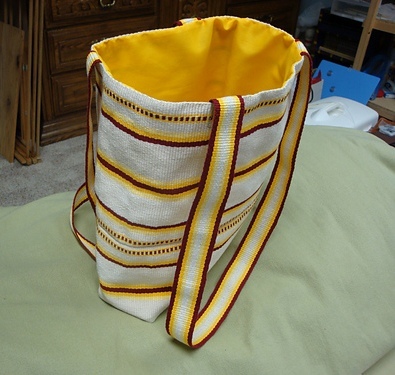 « Backstrap Weaving – Time for even more Play! Hey Laverne! Your new piece looks beautiful, and ambitious! Can’t wait to see the finished product. I guess you’re blessed to actually like making continuous string heddles….I’ll need a new mantra (“I love making continuous string heddles”). Thanks! When I am opening the heddles for the pebble weave, as soon as the shed has opened I let go of the opposite heddle but keep pulling up on hard the heddle I am trying to raise. I then swap hands and can pick up the sword with my right hand and insert it. Those al’ouerjan patterns were fun to weave and I loved the result, but do find the floats on the back to make the piece impractical. Can’t wait until you reveal the secret of how to weave them in! love your new weaving, colors and design. can’t wait to see the final result. love getting your blog on the usual Thursday, my little treat. Love the new piece! I know we are odd, but I actually like making the continuous string heddles too. The part that stymies me is the finishing of objects. Yes, Tracy’s piece is enticing and beautiful. I’ve been working on the socks that I promised my cousins when we stayed at their house in Santa Cruz, CA last year. I’m using Turkish style socks, with patterns from the book called “Simply Socks”. I think these patterns will work well with the simple float pick up. I think the one I’m following called “Crazy curl” is just the right size for my current WIP. It is a lot more complicated that the simple diamond and triangles I’ve been doing, but I think I will give it a shot. Too many WIPs. I need to follow some of your advice. I am intrigued by these sock designs you mention. I bought a book on patterns for knitted mittens of the Komi people of Russia for the same reason….gorgeous designs to adapt to my weaving. Hi Laverne! Wow, I am going to be on the edge of my seat all week waiting for the tutorial on tying down the warp-substitution floats. Thank you in advance!!!! Perfect timing for me, since I’m itching to get wider. Thanks for all the tips. It’s also encouraging to hear that you are inching your way out, little by little. I’ve been so impatient to weave wide, but if it’s challenging for you, it will definitely not be easy for me. I will take all your advice and share my efforts soon! Thanks so much Tracy. I ‘ll show the pictures this week as a follow up. Hi Laverne. It`s been a while since I`ve written to say how great your work is and how effectively you present it on your blog! A big thank you again for the fine way that you support all kinds of weavers everywhere! I`ve just returned from another LONG trip to India where I enjoyed meeting many weavers and seeing some outstanding examples of tribal textiles as well as fine silk Another huge dose of inspiration! India!! Imagine…I was born there and have not been back to visit let alone do a textile tour. I am sure we will be seeing projects from you soon with evidence of all the inspiring things you saw. I am from Antalya Turkey. Living and working around a farm.I am learning to wave from your site.Thank you very much. Your site is just like a big school!! Well, I use two times string for each string. I think, this is the reason but, my mother says me to ask you. Thank you very very much !!!!! I think that one of your problems might be the kind of yarn (strings) you are using in your warp. It shouldn’t be anything hairy like wool while you are learning. I recommend using some kind of cotton. I don’t know if you can get cotton for crochet where you live. This kind of cotton is twisted tightly and is easier to work with. You shouldn’t use anything that is soft or hairy.If you don’t use a smooth yarn, you will have trouble opening the sheds even of you have made your heddles and done everything else correctly. There are ways to work with the hairy yarns but this is not something you want to do as a beginner. Good luck! I hope this helps you.